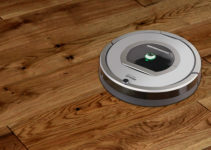 Technology has been developing at rapid speed every year, and nowadays, in a modern age, we are able to clean our floors without a mop and a bucket. Steam mops have been around for a while, but are they really worth it, and should you replace traditional way of cleaning tile floors with mop and bucket for a steam mop cleaner? Like any other product, it has its own advantages and disadvantages, so you have to consider the benefits and life improvements one steam mop can bring, and decide carefully. Luckily for you, in this post, I will help you decide whether steam mop cleaners are worth the money, what are their benefits, and how to choose the best steam mop for tile floors. To save lots of your valuable time, we’ve added here a quick comparison chart. Let’s talk a little about our listed 5 Steam Mop for Tile to give you a quick idea. 1 What Surface Is The Steam Mop Good For? What Surface Is The Steam Mop Good For? Steam cleaners are considered to be multi-purpose appliances which will provide you a hygienic cleaning by using steam. By using steam, steam mop cleaners have the ability to remove dirt and stains from any surface, including carpets, tiles, hard surface floors, and even ovens and windows. They’re also safer for the environment since they don’t require detergent, however, it takes some time until it heats up and starts producing steam. So steam mops are good for any surface, and they are proven to be safer for the environment, but are they really that good and will you benefit from it? Down below, you will find one of the best steam mops for tile surface. One of the advantages of steam mop cleaners over the mop and bucket is that it leaves the floor dry after cleaning. It means that you won’t need to wait for the floor to dry before walking around the house again. Another benefit would be that the steam mops don’t require detergent, which means there are no chemicals used to clean the floors. It’s safer for the environment, especially if you have a small child or pets who like to play around the house. However, if you come across a stubborn stain, some steam mops will have a detergent dispenser in order to clean the stain more easily. Steam mops are easier to use in general and will save you a lot of time and energy. They’re an all-in-one device, so you won’t need to dunk your mop in the bucket constantly, and you won’t need to wait for the floor to dry. Although, keep in mind that the steam mop cleaner cloth will have to be cleaned in a washing machine once it gets dirty. Down below, you will find the best steam mops for tile floor surfaces. If you’ve already decided to go find and buy a steam mop for yourself, or if you only want to know how to choose one – you’ll have to understand some of the steam mop features and things to consider before the purchase. In order to find the best possible steam mop for your needs, you will have to ask yourself a few questions to determine which steam mop will suit your needs. The water capacity of steam mop cleaners is measured in liters. If you go for a steam mop with higher water capacity, you won’t have to refill it that often. Steam mops with higher water capacity will be able to clean a larger surface, however, they might take longer to heat and produce steam than steam mops with less water capacity. Steam line is the time that steam mop produces steam before it runs out of the water. That feature is linked directly to the water capacity, and with common sense, you might figure out that the higher water capacity your steam mop has, the longer steam time you will have. It will give you the ability to cover larger surfaces without running out of steam, which is suitable for people who have a large house. Heating time is the time it takes a steam mop to heat up, produce steam, and be ready for use. It’s also linked to the water capacity, because the larger the water capacity is, the longer it will take a steam mop to heat and produce steam. Accessories that come with the steam mop will determine how many surfaces you can clean with your steam mop. Some steam mop cleaners come with accessories that will give you the ability to clean ovens, and even help you to remove creases from clothes and curtains. These are one of the most important factors to consider, and by following them, you will get the idea which steam mop cleaner will be suitable for you, and which won’t. In this Bissell steam mop review, you will find out how the cleaner cleans naturally with steam, in which way it eliminates 99% of germs when it’s used as directed. It features a removable Lift-Off POD that will give you the ability to clean as many surfaces needed, including counters, sinks, windows and much more. With Bissell steam mop, you will also get 13 additional specialized accessories which will help you clean different types of materials. You will be able to clean the tough and sticky mess on the floor as you go, thanks to the flip-down EasyScrubberTM. After you’re done cleaning the floor using Bissell steam mop cleaner, your home will have a fresh scent, without any odors. Bissell steam mop is made to clean and sanitize any type of floor without chemicals, using only water. It also features above-the-floor steam cleaning which will give you the ability to clean surfaces which are above the floor. Natural way of getting rid of germs, without using chemicals. Above-the-floor feature for steam mopping different areas such as kitchen sink. Steam isn’t as strong, and it might not be able to clean the worst and dirtiest floors. In this Smart Living Steam Mop Plus review, you will be able to see how will it benefit you and your household. It uses only water which heats up until it reaches 110° C. That’s the perfect temperature for the steam to clean the floors without the need for additional detergents and any other chemicals. With Smart Living Steam Mop Plus, you will be able to sanitize anything from ceramic floor tiles to vinyl, and wood laminate floors. For everyone who has tile floor surface, this might be the best steam mop for tiles. Smart Living Steam Mop Plus uses distilled water, and once you fill it up with distilled water, all you have to do is wait until it heats up to the 110° C degrees. Once the Steam Mop Plus is heated, attach a reusable microfiber pad, and then with the power of Mop Plus, you will be able to clean any floor surface. Smart Living Steam Mop Plus is all about thinking sustainably and removing all the visible dirt and stains while cleaning the floors. It will provide you with amazing results without the need for chemicals and detergent ingredients. Easy to use and clean any type of the floor. Cleans using only high temperatures which produce enough of steam to clean even the toughest dirt and stains. Amount of steam it provides thanks to the high temperature of the water. Steam doesn’t dry so quickly after the cleaning the floor, which might depend on the location and environment. 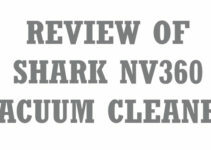 In the PureClean XL Rolling Steam Cleaner reviews, it has been rated 5 stars by more than 80% of the customers who have already used and tested it all around the world. It means that PureClean mop steam cleaner is as useful as advertised and it will serve you and stay with you for a long time, thanks to the quality build and design. PureClean XL will provide you an 18-piece heavy-duty set with which you will be able to thoroughly clean your home indoors and outdoors. With all the essentials and accessories, you will have a wide choice of use. It has a 1.5-liter tank with which you will be able to steam up to 45 minutes, which is more than enough for small, medium, and even large objects and floors. Hot steam which is produced will naturally eliminate grease, mold, stains, and even bed bugs. PureClean XL is a natural steam cleaner which only uses water, without any other chemicals and detergents. It creates a safer environment for kids and pets. You’ll be able to safely use it on many different surfaces such as ceramic tile, granite, waterproof wood flooring, laminate tiles, most cotton and wool carpets, and even washable wallpapers. As long as you follow the manual and guide, there are no possibilities of damaging any floor surface. The cord which isn’t long enough might give some people trouble with bigger rooms and floors. PureClean XL has an extra long 16-foot long power cord, which won’t restrict you and you will be able to steam without changing the outlets as you go. When you aren’t using PureClean XL, cord wrap will help you store it away and keep it safe. To prove their quality, PureClean XL comes with a 5-year warranty which will keep you protected from any problems during the first 5 years of purchase. 18 different accessories which come with the PureClean XL steam mop. Cleans only in a natural way which is safe for the environment. Can be used on many different types of surface. Extra long power cord for easier handling and steaming. 5-year warranty will have you covered in a case of a problem. Price is reasonable and PureClean XL is worth it. It has a long cord, but a short tube. It could have been longer, which would improve the usage of this steam mop. If you are looking for a steam mop which has a medium to high level of water capacity, Oreck Steam-It steam mop is the right choice. It will leave you with 40 minutes of steaming on the full tank, and on the highest setting. You will be able to sanitize floor surfaces by focusing the steam on the floor for at least 5 seconds, and the cleaning is 100% chemical-free. In this Oreck floor cleaner review you will find out how the steam mop will work the best with tile and grout surfaces, and all you need to have in order to steam is the tap water. Produces approximately 40 minutes of steam (on high setting) on a full tank. Can sanitize hard floor surfaces by focusing steam while mopping for at least 5 seconds. Chemical-Free cleaning. Great for tile and grout. Cleans using only tap water. Works upside down without spillage. High temperature dry steam melts away dirt and grime. The best feature, in my opinion, of the Oreck Steam-It steam mop, is that you get the ability to use it upside-down and there won’t be any spilling or whatsoever. It’s a great feature which will give you the ability to steam mop many areas which are maybe harder to reach. High-temperature water and dry steam will melt away any dirt, grime, and grease. Another great feature which is unique and can’t be seen with other steam mop cleaners is that Oreck Steam-It steam mop gives you the ability to use the household towels as mop pads thanks to the universal cleaning clip. However, if you don’t want to use the household towels, you will still be able to use the mop pad which comes with the steam mop cleaner. It’s washable and reusable so you will be able to use it over and over again. Steam is adjustable which is a great option to suit your steam temperature to different surface types. All the controls are available at a distance of a fingertip, which is very convenient while you’re steaming. Medium to high water level capacity tank. Ability to clean almost any type of floor surface. Ability to sanitize the floor. Ability to use it upside down to reach areas you couldn’t reach otherwise. A universal clip which lets you use household towels as a mop pad. Adjustable steam level, and controls which are placed perfectly. Mop only pushes away but doesn’t pull toward you which might make it a little bit more harder to use. Bissell is a brand which is very popular among the cleaning devices, and it’s one of the leading brands. This is the third Bissell steam mop on this review list, and it truly deserves it. You can’t miss by going for any of the Bissell steam mops, especially PowerFresh Slim steam mop. 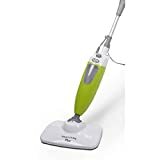 If you don’t have a lot of space around your house, yet you still could use a steam mop cleaner, after reading this Bissell Powerfresh Slim steam mop reviews, you might be able to find the right solution. It’s slim which means you will be able to get it to the areas of your home where other steam mop cleaners couldn’t. 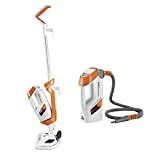 You will be able to use this 3-in-1 steam cleaner to clean both on and above your floors with a fully upright steam mop. It also features an extension Wand and handheld steam cleaner. 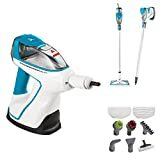 Bissell Powerfresh Slim steam mop comes with a toolkit which will give you the ability to carry your tools as you clean such as grout tool, angle tool, flat scraper tool, bristle scrub brush and much more. There are even bonus tools that Bissell offers such as flat surface tool with mop pad, clothing steamer tool, bristle scrub brush which will give you the ability to brush above the floor surface. All the tools are able to be attached to the end of extension which will prevent you from losing them, and always have them next to you when you need them. One of the best features, in my opinion, would be the Swivel steering to get into the tight spaces. Wall mount will help you save space when you aren’t using the Bissell Powerfresh Slim steam mop, and that’s why this steam mop cleaner is one of the best for people who have limited space. Slim steam mop uses only water and cleans germs and bacterias in a natural way without the need for chemicals or detergents. One of the best brands for steam mop cleaners. Slim model for households with less space available. Attachment to carry tools as you are cleaning. Swivel steering to reach places that are hard to reach with other steam mops. No noise and loud sounds while steaming. Having to buy replacement mop pads often. To prolong the life of your favorite cleaning device, you will have to spend some time maintaining it. Many people get a headache when cleaning is mentioned, but since the steam mop cleaners make your life easier, maintenance is very simple as well. In order to be sure that your steam mop will last longer and work properly, you should never add chemicals or detergents inside it. Also, it would be even better to use distilled water instead of a tap water. Ensure that the tank is full and contains water when you are steaming, in order to avoid problems. If there is not enough water, there’s nothing to emit the steam and your cleaning process won’t be as efficient at all. Replacing the filter is one part of the maintenance, and you should do it at the required interval. Using old filter may damage the unit and results won’t be that good at all. Wash the mop pad after every use so the next time you use it, you clean your floor with a clean mop pad instead of a dirty one. I would also highly recommend you to empty the unit and wipe it after every use. It doesn’t take a lot of time, but it will help you prevent the scale from building up inside the unit. The steam nozzle should be cleaned often too in order to produce the steam just like it did the first day of use. These are just basic things you should do often. Some of them every time you use the steam mop, while other on a regular basis. It will prevent your unit from getting damaged, and to ensure that it works the best possible. It shouldn’t take long, and if you benefit from the steam mop, I am sure that it deserves some maintenance. 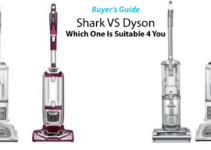 In this post you’ve seen best steam mop for tiles, but also the guide how to choose one and why are they so useful nowadays. I hope that you have realized how useful steam mop cleaners are, and if you go for any steam mop from the review list above, you won’t regret it. There are many benefits which will save your energy and time, but make your cleaning process way easier as well. If you are in doubt, I recommend you to check out any of the Bissell steam mops since they’re one of the best ones in my opinion, and they will serve you well for a long time. What do you think is the best steam mop for tile surface? Are you using a steam mop or you are thinking about getting one? Feel free to leave a comment, but also feel free to ask any questions and I will be there to help you out.